There are probably thousands of blog posts already on how to edit blog photos, not to mention a load of YouTube videos as well, but these are just some of the adjustments I use on an everyday basis. I try to do as little editing as possible, as we all should really, but sometimes especially in Winter we all know that the lighting sometimes isn't as perfect as we would like it. This is the first thing I do to edit my photos. Sometimes if I've taken them in nice perfect lighting that doesn't need much editing this will be the only thing I do. Essentially this either increases or decreases the intensity of your highlights and shadows. So, makes the blacks more black and the whites more white, perfect for those beauty flatlays! As you can see in the example the white of my sketchbook looks bright rather than dull. 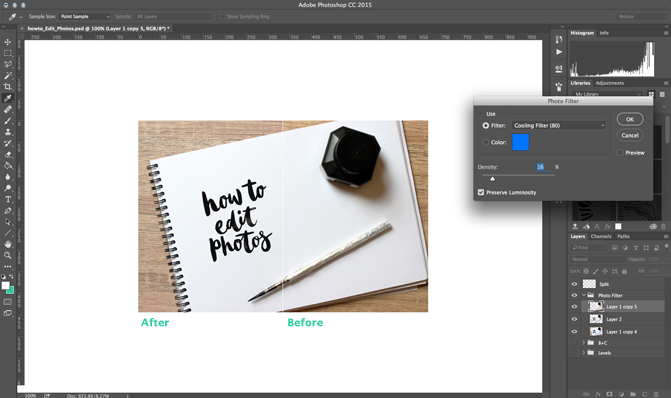 Tip #1 // Change the background of your Photoshop to the colour of your blog to make sure your photos work nicely once uploaded. To do this right click on the grey background space surrounding your image and click custom. I make mine white so I can tell how bright my photos will look once uploaded. If you've played around with the levels and still feel like your photo still needs a bit of dimension then the brightness and contrast filter is where you should go next. You've all played with Instagram and essentially this is the same, but remember less is more. Don't go overboard with the contrast. Tip #2 // Work at 100%, I'm not sure if this is a fave for all but personally seeing my image how it will look on my blog makes it so much easier to edit. That added to having the custom background means it's really easy to see how it will look once uploaded to your blog. This will all be down to personal preference but I like my photos to be more on the cooler side, so depending on when/where I took my photos sometimes they'll lean more towards the warm side. This is where the photo filters come in, if my photo is a little warm I'll add a blue filter. The thing to remember (which is pretty obvious if you use these) is to only use them on a really low opacity. Tip #3 // Sometimes not all of the photo may need editing, for example if you have a lot of white that part may need more brightening but less of the photo filters. 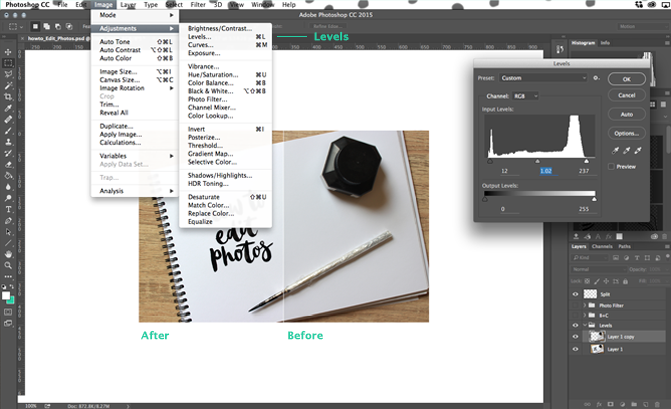 You can separate parts of your images using the selection tools and edit them separately. For example I cut out the sketchbook with the Polygonal Lasso Tool (L on your keyboard) so I could edit the background with the photo filter and the white part would stay white rather than tinging blue. After that it's all a case of going with whatever adjustments you feel you need to do again to make it perfect. But remember less is more, you don't need to use all of them, you don't have to use any of them too much to make a big difference. 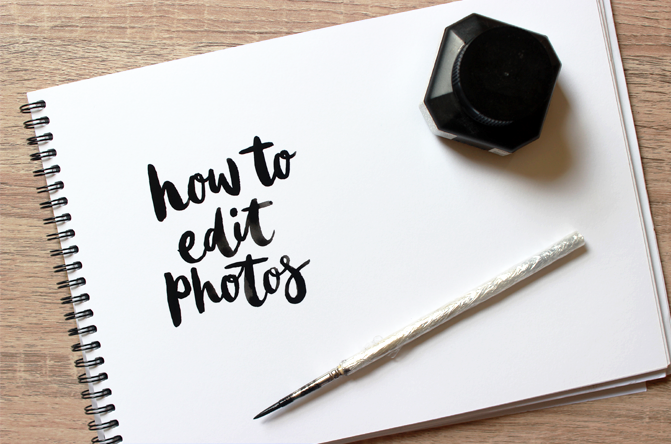 If your photos need a LOT of editing in order to get them to your liking than maybe you need to change the way you take photos to make the post production simpler. It all takes practice and my photos still aren't perfect, hell sometimes I'm not happy with them at all but we'll all get there in the end if we practice. 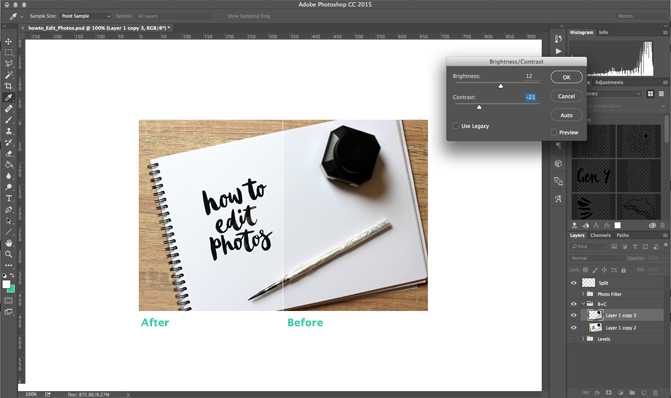 Once it's edited you can add text and a watermark like in the first Photoshop Basics post. Let me know if you have any problems. Or if you feel you use a different adjustment you find works better for you I'm sure we'd all love to know, I know a few people love the Curves adjustment but I'm not personally a fan. Feel free to try out all the adjustments on your next photo and see what works for you! Next week is all about resizing photos so stay tuned!